What is my purpose? The great question we all ask ourselves at some point. I think this question has a remarkably easy answer, it’s the path there that is hard. This is because the answer to this question falls under a couple of other bigger questions. There are really two types of God’s will present in the Bible. There is God’s sovereign will, which is a will of God that must need come to pass. And then there is God’s moral will, his will for our obedience. An example of God’s sovereign will would be the statement “Let there be light.” An example of God’s moral will would be “You shall not murder.” What is interesting about this is that many people struggle to find their purpose and calling. Hey guys, welcome to another edition of ManTalk. I'm your founder and host, Vince Miller. Good to be with you. Excited to have Keith TerHaar with us today from intended for health. Uh, excited for our conversation again, man. How are you doing? Great. Yeah, feeling good. Good. Awesome. That's good to hear. A physical, spiritual and emotional coach ready to go to kind of help us out. So we're excited to have you guys were still in our series on 30 virtues that build a man. I want you to pick up a copy of this book. It'd be resolute.org forward slash 30 t h I r t y, uh, today we're in the lesson entitled Self Discipline, which is a perfect lesson for spiritual coaching and physical coaching, emotional coaching, right? This kind of holistic approach to that. Um, I know we, we teed this up a little bit last time, but explain to the guys again what you do with other guys just so they get a good picture of it. Well, my title is integrative health coach, which is really a means. It's a catchall for all kinds of different behaviors that guys want to change. So you know, the low hanging fruit is diet, exercise and those things that we naturally think of as health related, but it might also mean a spiritual health, relationships, stress management, a career, things like that. And, and to your point about, uh, disciplines, I think anytime you want to make a change, it's really hard to do that without committing to becoming more disciplined at something. Yeah, I love, I love that. I think Keith, one of the things I've always appreciated about you is you're experienced in all these fields of work you've had experience in a physical coaching, a spiritual coaching and even in counseling, so emotional issues and all that stuff and you just have this real broad swath of experience and a lot of expertise over years. And so I want to dig into this topic on self discipline a little bit because I self discipline is really, I don't know, I don't think. I don't think the guys really like that word to be quite honest, unless, unless they're applying it to a very specific thing that they're super passionate about. Right. Then self discipline I think comes easier. But self self discipline doesn't sound like a really enjoyable term. It sounds like we're beating ourselves. I mean, how. How would you define self discipline? Well, I define it as a consistent commitment to a change of behavior and, and I agree with you, we don't like it because I think often what it brings up for us as failures in that. Right? Yeah. And in fact a lot of guys and women too probably would say I'm just not disciplined, you know, I, I am not a disciplined person and I get that because I wouldn't say I necessarily am either, but I would also say that if I've been serious about something, I wanted to accomplish something I wanted to change or an area I wanted to grow. I just didn't have a choice. I had, I had to become more disciplined and part of what came with that is not just white knuckling it or gutting it out. It was about figuring out a plan for how to make that happen, how, see how I can stay consistent and that usually I think for most guys means reaching out to somebody else to say, hey, I need help with this. Right. Okay. So, so check this out. So, uh, I was in the gym yesterday and go, yeah, I know I'm, I'm trying. Right. And so what I've been trying to do is double unders. Do you know what I'm talking about? Jumping rope and doing double spin unders. And I've been working on it for six months, six months and I got coaches there to kind of helping me out, teaching me whatnot. So yesterday, a couple of times I stepped on the rope when I was jumping and I slapped myself. I don't know if you could see it here. I've got a couple of stripes right there. I mean those are pretty good, right? I know. Yeah. I want to let you know that one hurt, but when I did it Kinda in the same spot the second time it hurt more and I looked down on it. It was almost bleeding yesterday. In fact, it's still kinda hurts, but that's what I think of, think about when I think about, see about whipping myself. Right? But um, there's, there's all these components of self discipline, right? There's the component of like kind of wanting to change so you impose the discipline on the self, right? And then there's the word discipline which is about kind of like this feeling of kind of a beating ourselves into submission to do something that we want to accomplish. Right. And then there's all these variety of forms of like self discipline to get the motivation to move, so exerting different types and styles of discipline to self so that our motivation and the outcomes will change and it, I find it to be this very complex thing that we're not really comfortable with. The fact that we really know how it works, but sometimes we stumble into it and we engage in it and we learned by. We get a few stripes along the way, but then we learn ways not to do it right ever again. I'd been working on the stinking dumble under thing for like six months, no joke. And I still can't get it, I've gotten about 10, but people still stand at my side saying keep after it, keep after it, keep after I keep whipping myself, of course. But, you know, keep after it and slowly I've gotten better. You know, I've gotten 10 in a row. Yeah. Which, which ain't bad, but I kind of want to just kind of get like 20 or 30 in a row and I'd feel better about it. Yeah. So what's your motivation for that? I'm just curious. You know, my motivation is. That's a good question. See now you're getting me. I liked the. So I think my motivation for doing it is it really disturbs and bothers me that I can't do something athletic because everything has always come easy for me. This is like my arch nemesis. Right. And so it's a challenge of it. I even went out and bought a rope on. I have these experts kind of show me how to do it and they just keep telling me to try, try, try, try, try. But I know one of these days I'm going to get it. I'm going to feel good. Right? I think that's my motivation for doing it is that I, I want to be able to do something that I can't do to challenge myself and I don't even think it's about the exercise to be quite honest with you because I can jump the rope all I want and I can get exercise by running and I can do other things. But it's like, I think it's me trying to do something that I. and you know how I am. I like to try new things all the time. I've pushed myself pretty hard. So. But uh, I think that's my motivation maybe. I mean, you tell me you're the counselor. I think I'm right. Well, it's interesting. Some people do really like a challenge, you know, and it doesn't necessarily have to have a higher motivation. You just want to accomplish something. You can't. I would probably argue that most people need to have their behavior really connect with something of higher value to them. There's something really important because we'll tend to abandon and overtime if we're y'all, what was the. now. I guess sometimes it's fear. Sometimes it's, sometimes it's pride. Yeah. Right. So all those things can be helpful to us. I think over time though, you know, this is something, I'm guessing in five years if I talked to you, you probably wouldn't be that important to you anymore. Maybe. Yeah. Maybe. Maybe. Yeah. Whereas some of the more significant goals we have are changes we want to make. I think I would say, is this going to be important to you in five years? And if you said yes, that would be reason to say, well, let's figure out how to get that done. Yeah, let's, let's you sell the gifts of motivation is make a plan and let's develop a discipline around. Yeah, okay. Yeah. I feel like I need to write you a check for a time right now. I feel like I've answered private counseling. That's fine. Okay, so I'll do that. But uh, yeah, that's interesting. And you brought up, there could be some fear and pride. Now I hear you on that and I think that some of the problem that some of the initial motivation for self discipline, right is a little bit of fear, a little bit of pride. Sometimes pain is motivation for self discipline, but I truly believe now just hear me out on this. I believe that that discipline is both an input and an output, Kinda like obedience. It's both an input. And here's what I mean by that is we use discipline to get our motivations to change so that we can faithfully engaged in discipline for the right reasons, right? So discipline is something that we use to externally motivate us to get the heart and the motivation to change so that we can be disciplined. Right. On the other side of it, and I personally think now you tell me if I'm wrong about this, I personally think that it's okay to have a little of fear, a little bit of pride over here, as long as in the process of engaging in these disciplines, the heart changes, right overtime. And I think that's what you're suggesting. Am I wrong? are there, right? But that said, you know, sometimes fear, um, can be the right motivation, you know, and I think about the way that God, a fierce part of God's design in that it keeps us from doing certain things that we shouldn't do. It makes us do things that we should do at times. Right? So, and I think we realize, you know, as a parent, you know, sometimes you initially would like your kids to be a little bit of free. Yeah, right. To get them started, but you don't want to, you know, to function in that the whole time. Right, right. Yeah. I'm sure you've seen ramifications of that in your counseling career. Like, you know, fear that just continued to exhibit itself in unfortunate behaviors over a long period of time and therefore we need counseling about it. So what I, what I hear you saying is it's okay to have a little bit of fear over here. I mean, we do that as parents, right? We sure we use fear as a motivator for discipline, right? But what we don't want them to do is to live in that negative fear. We want it to change to kind of a loving fear, a holy fear, a reverent fear over time, not just, I'm scared of you kind of fear. So I think that's kind of a little bit of what I'm suggesting here is we start off with maybe the wrong motivation for the right reasons, but what we got to do is change it to the right motivation for the right reasons in the process of discipline. You Sir, I'm getting at. Yeah. So that that discipline changes, but what we're inflicting this upon ourself is really what we were talking about. Self discipline, right? That's, that's a whole nother topic. It's not something something else that someone is exerting on us inside of a confined environment. Now we're talking about the loose environment of us disciplining ourselves and I'm assuming that some of the people that you're working with as you engage in holistic coaching, right around food and diet, around health and fitness, around spiritual care and emotional problems. Right? I'm assuming that some of these, these people, guys and gals have an issue of self discipline. Always. Always. Yeah. And I almost think self discipline is, is a misnomer. If we take that to mean it's all up to you, right? It is just, you know, to me, God has placed us in community and we regularly look to versus like iron sharpens iron, so forth, but we have a western mindset, especially in this country that we ought to be able to do everything by ourselves, you know, pull ourselves up by our own bootstraps, all those kinds of things. And I think that that is really not what God told us works for us. He's talked about being part of the body. And so I, I think even though we look at self discipline as this means, it's something I am doing by myself. I think for most of us, we really need help. We need someone else. We need a brother. We need accountability that comes not from somebody chasing this down to slap her hand from, from doing things we shouldn't do, but someone that we've actually invited to be a part of our process. Yeah, I think that's where what you're doing is so valuable. And you know, we talk about this all the time on the show is we talk about the value of having another brother in our life, right? You got to have another brother in your life because you can't do life alone. And iron sharpens iron. If iron is exist by itself, you know what it does it Russ, iron rusts when it never gets used. It's got to grind itself on another piece of iron. And then what happens is it gets used and it gets sharper every time we rub it against another piece of iron. And I think that's the ingenious piece of proverbs 27, 17, is we got to rub up against other people. We can't do life alone. Now, uh, you know, in this, in this, uh, chapter self-disciplined from 30 virtues that build a man, we're, we're digging into, I think it's one of the great athletic verses of the Bible, First Corinthians chapter nine, and it's talking about runners running a race and that only one gets the prize run in such a way to get a prize, right? I think it relates to what we talked about in the previous lesson on obedience is that we, we, we want to be our own God, so we'd like to have a time and space to do what we want to do. And yet I know for myself, talking with successful men and people who have done a lot of things with their life, usually the story they tell is of, of some real that they developed and did. So I think I take it back to whose life isn't, you know, is it yours to do whatever you want with or are there things that God has our, their talents and gifts he's given you that you need to use? And to do that really well, you need to be like an athlete who says, I'm going to, I'm going to work at this every day. Right, right. So let me, can I say back to you what I just heard? And I think it's really, it's actually profound. Uh, it sounds like to me that the discipline, we engage, the self discipline. When we understand who we belong to and when we find our identity in the right thing, you know, if this life is mine, if it's mine to do what I want with, if it's mine to live my life and my career and my way with my money and my body and my things, then yeah, we can. We can live in egocentric life and there's no need for discipline other than the what we want, but if we place ourselves underneath the Lordship of Jesus Christ and our body is his temple and all that belongs to him, then we're called to go under the strict training for a crown that will last forever. Then the training that he's calling us into is not only the bodily training, it's mental training and emotional training. It's a spiritual training and it's going into the strict training as if my, my tool, my vessel belongs to him and I treat it as if it belongs to him preparing me for another eternity. And I mean, are you having those kinds of conversations with guys and helping them to see things from that perspective? Yeah, and I love that passage about, um, you know, the, the turtle nature of the rewards of this training, right? Yeah, exactly. So, so many things that we do, we spend our time on, we realized there are so temporal, you know, everything we do to gain possessions or make money and so forth. It's like, well, that's not going to go very far beyond the grave, but um, some of the things that we can invest in now we're promised that's gonna have eternal value. Yeah. Yeah. It's a whole mindset. Worldview change right in. And I think that, I think there is some of what Paul is saying there in First Corinthians chapter nine where he's trying to convince us that they're, there are more valuable things to be thinking about. It's Kinda like you've said to me, you've said, you know, what are your five year goals, where, where do you want to be in five years? What does that look like? And start thinking about that, but not just then, but all the way to the end of life into eternity. Like where's our mindset, where do we want to go? And if we truly do belong to Jesus Christ and all of this belongs to him, then let's treat it as if we're stewarding it for him. I mean, there's all kinds of stewardship stuff in the Bible, all kinds of, uh, identity stuff in the Bible, all kinds of a dollar tree stuff in the Bible. disciplined. Yeah, I, I agree. It's, it's a starting point. If you start with, well, this is my life and my body, whatever it's going to take you down that road of, well, what I feel like doing it today, you know, so the, uh, the whole approach of disciplines obviously begins, you know, as we've talked about with the spiritual disciplines and you know, as you, as you talk about that with guys, where do you usually start? You know, I, um, I don't, you know, I don't know if I always start at the right place to be quite honest. I think that, you know, when, when a guy comes to me in regard to spiritual disciplines, you know, of course I've encouraged them with the classics, you know, there's reading the Bible and prayer and I think guys have a lot of trouble with those two disciplines. I think many guys are not praying on a regular basis or not reading the Bible and on a regular basis they're not engaged. And I tell guys, just, let's, let's take some small steps. Why don't you start with praying for five minutes a day, right? Because I think we bite off more than we could chew. You know, I, I took on double unders. I feel like I've bought a mortgage. You, I probably just need to learn to jump first and maybe it's just a process job. In fact, my coach said that to me yesterday. It says, why don't you just practice jumping on your toes as high as you can? And I was like, oh, that's interesting. Maybe I should start there because I keep stepping on the rope. Right? And sometimes I think with self discipline and spiritual disciplines, we bite off more than we can chew, so why not just pray five minutes a day or read the Bible five minutes per day and try to do that as many days in a row as possible or just as regularly, don't even worry about how many days, just do it regularly and it start to develop patterns and once you develop the parent and then take it to the next level, read 10 minutes a day and then pray 10 minutes a day, et Cetera, et cetera. And I, I think, I think when it comes to spiritual discipline though, as it relates to men, I think we just don't know even what to do and we're not sitting with other people that are modeling it for us. I mean, just think about it. How many, how many spiritual disciplines do you model in a Sunday? Worship Service very regularly. I mean, they're not modeling it for you. I mean, you count how many minutes someone prays for you, uh, in, in a Sunday service. I bet it's less than a couple of minutes to be quite honest with you. I'm count how many times have bibles being read from a platform on a typical Sunday morning. It's read very little and I'm not saying that to be judgmental of the church. I'm just saying we're not seeing it modeled. And then we go about our week and then we don't understand how to do it. So I think this is where that relationship with another brother comes in and as we got to sit down with a Bible together, we had to read it together, we to pray together. We had a model it together and practice it and then just keep the pattern over and over and over again if we do it repeatedly, we learned something, but I don't know, I think that's probably part of that part of the problem with spiritual disciplines specifically. But I guess I'm just worried about discipline in the church and I'm not talking about church discipline. I'm talking about just discipline in general for us as man, like engaging this theme of discipline and encouraging one another to develop healthy patterns so that we can come the man that God wants us to be down the road. So that's, that's Kinda where I would. I would began anyway. I, I would encourage guys to grab a copy of a book like this 30 virtues that build a man and started having conversations with men where you are opening the Bible, you're having regular conversations, you're encouraging one another and you're talking about things like self discipline. I mean, I need some self discipline in my life and it's a place not just with double unders, right? But with other things. And um, I think practicing this out and trying it is very important and having the conversations in a meaningful way. And then, like you said, positive accountability, like, like what did you do it this week? Did you read your Bible this week? Yes or no? Why? How can we remove those obstacles and, and create, create new opportunities for you. So, well, we're made to be together. I think when we take anything on, if we have a partner or someone were doing with it, you're doing it with. Yeah, we're just so much more likely to be successful. Exactly. I think so too. So thanks for being with us today, Keith. And, and thanks guys. 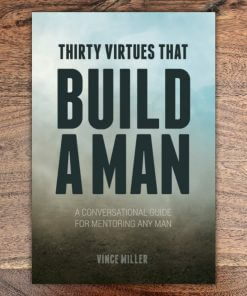 I hope that you'll pick up your copy of 30 virtues that build a man straight from our website. Be Resolute Dot org forward slash 30. Pick up a copy if you want to give away copies, even two men in prison. Um, and in the military, men going off to college, whatever, we would love to have you sponsor a box. You can do that as well. Run on the website, uh, be resolute.org. So until next time, have a great week and be resolute.